If you suffer from back, neck, joint or muscle pain, this may be the most compelling article you ever read. ello. My name is Dr. Jonathan Tait. I am a triple-board certified Functional Sports Medicine and Injury Recovery Specialist. Today, I am going to reveal the number one overlooked cause of pain and inflammation. I will also tell you about a revolutionary pain killing solution that nine out of ten doctors don’t know, or else simply don’t have the time to teach you. Some physicians and other medical practitioners have kept this hidden from you in order to continue charging you and your insurance company for more costly treatments. According to the Institute of Medicine of the National Academies, more than 116 million people suffer from chronic pain each year in the U.S. alone. Yes, 116 million people just like you living with constant back, neck, knee, or shoulder pain. Is the pain so miserable that it is sapping your productivity at work, keeping you from playing with your kids, and ruining your relationships with your spouse, family, or friends?Are you fearful that the pain will be worse for you tomorrow, feeling forced to take pain pills because it seems like there is no other way to kill the pain? If you are that person – sick and tired of consultations with various specialists, lab tests, x-rays, and MRI’s, all ending with recommendations for more pills, shots, or even going under the knife – then this is the answer you have been looking for. I’m going to start with telling you my story and my journey to finding a better way to deal with constant pain. In fact, it was this experience that shaped the direction of my career choice as a calling to help people live life on their own terms, instead of letting pain control their lives. compressing a nerve, most likely the result of repetitively straining the disc with years of physical work. That explained the pain in my leg that just wouldn’t go away despite the medications, chiropractic adjustments, injections, and months of aggressive physical therapy. Flash back to Spring Break 2001. While my friends and classmates were cutting loose for a week after surviving the first couple semesters of medical school, I was taking a vacation at the local hospital getting back surgery. Weeks of physical therapy followed, the pain slowly eased up, and I did well for almost two years until the disc re-herniated and the same familiar pain returned. After being stuck in the pain cycle with more medications, shots, and physical therapy again unable to relieve the pain, I elected for a second surgery. Everything was back to square one. After recovering and working through yet another course of physical therapy with a great physical therapist, I was able to make a full return my previous training and recreational pursuits, albeit older and much wiser about how to train to avoid a recurrent injury. Working through the injury twice was a time-consuming and very frustrating learning process, but it was an education much different than what I was getting in the classroom. This literally put me in the shoes of my patients, and would change the way I looked at and treated pain forever. The experience no question steered me towards my chosen field and calling. Every day, I help patients navigate the difficult road to recovery, and come out the other side with less pain and a better life. So is that the end of my story, never to have pain again? Was I cured by modern medicine and the latest advances in surgery? Unfortunately, no. Although my back and leg has had a few moments over the last ten years or so, with minor flare-ups, the winter of 2012 was a whole different story. I had gotten involved in a 26-mile one-day charity hike to support children’s cancer research. We had raised a significant amount of money and had trained intensely for the big day. In fact, I was probably in the best shape of my life the day before the hike. Upon waking up the morning of the hike, something was not right. As I was getting ready I felt some numbness and slight pain in my right leg. Being the stubborn athlete that I am, and knowing what a great cause we were supporting, I decided to complete the hike anyway. By mile 9 I could feel the pain intensifyingand my leg losing some strength, but I pushed myself through the entire 26 miles (ended up being closer to 30 miles thanks to a poorly marked last turn in the trail!). In hindsight it was probably a pretty stupid thing for me to have done, but we’ve all made a dumb decision to continue on when we knew we should have stopped. My old familiar “friend” had returned – pain. And this time he brought his ugly cousin – weakness. The combination was even more disabling then what I had been through before. I was literally hobbling around the office for weeks with a cane. I looked like a bad imitation of Dr. House. As the saying goes – A physician who treats himself has a fool for a patient, so I sought the help of a colleague to get me on the road to recovery. Are You Stuck in the Pain Pill Cycle? Fortunately for you, I help patients break free of this “health care” merry-go-round every day in my practice. My personal experience and over more than 14 years helping patients get out of pain has revealed one major flaw in how we “treat” pain in the United States (and many other countries). Complain about pain – get prescribed a pain pill. This can be a costly catastrophe waiting to happen. DISTURBING TRUTH #1: They “Hide” the pain instead of FIXING the cause. You’re driving down the road. Suddenly, a signal light on the dashboard of the car begins flashing, telling you something is wrong. Like the wiring system in a car, your body is trying to communicate “service engine soon”. If this happened with your car, would you just cover the signal light with a piece of tape and keep on trucking? Of course not, you would have the car looked at to determine the underlying cause triggering the warning signal. By taking pills and shots that hide your pain instead of really getting to the cause and fixing it… that’s exactly what you are doing. DISTURBING TRUTH #2: They increase your risks of getting injured… again. If the pain signal isn’t there to warn your body that it’s about to get injured, how will you know it’s time to slow your roll in the gym or in your daily activities? Because the pain signal is being turned off to some degree with pain pills, you may not be aware that the next injury is just around the corner. DISTURBING TRUTH #3: They are effective… until they are not anymore. These pills promise to get rid of the pain, and most can do that for a while. But even if you don’t experience any of the many possible side effects they have on your body, these medications often lose effectiveness over time. That’s when your doc gives you even stronger pills, with potentially stronger side effects. DISTURBING TRUTH #4: They may actually be INCREASING your pain. “But doc, I don’t take any of those big time pain-killers; I just use ibuprofen so I don’t get so sore after my workout.” I hear that all the time from some of the more athletic patients I treat. Think that ibuprofen or other pills you are popping every day are harmless? Think again as studies have shown otherwise. You read that correctly. A medication commonly prescribed FOR PAIN, could be a contributing reason why you are having MORE PAIN. (I am going to explain this in more detail below) This information has been around for more than a decade, but unfortunately has been largely disregareded by most health care providers. More recent research has shown the same, but still is being largely ignored by mainstream medicine. What Do Tomatoes, Potatoes, Eggplant And Bell Peppers Have In Common? I’m sure you already know that eating too much sugar in sweets and treats, or even some dangerous fats in fried foods won’t only potentially make you fat – these foods increase inflammation that can lead to more pain in your body. You might have heard about how gluten can be a problem too. That’s why you see “gluten-free” foods everywhere these days. But these foods are not the only ones that can increase inflammation… tomatoes, potatoes, eggplant and even bell peppers can be serious pain triggers. You see, these foods are part of a large group of plants called nightshades. For most people, nightshades are not a problem at all. But for some unfortunate folks, consuming just a little bit may trigger serious inflammation and joint pain. All nightshades contain natural toxins, known as alkaloids, that can trigger increased inflammation and pain in 1 out of 3 susceptible people. You could be that one unlucky person, but I’ll show you a simple way to figure that out. I know this is hard to believe. My patients have told me all sorts of skeptical comments: “But doc, I’ve been in pain for YEARS. This can’t possibly help my pain!” “How is it possible that this can work in only two weeks?” “Nothing has worked for me over the last two years, and you’re saying this can help in two weeks.” “Changing my diet is going to help more than these pills? You’re kidding, right?”“I’ve been on pain pills for ever, and I’m going to need to take them for ever, regardless of what I eat.” It is OK to be skeptical, especially when you have tried so many treatments for your pain without success. Spending hundreds, or even thousands of dollars on medications and supplements without any significant relief would make anyone skeptical (and angry!). The thing is: I have seen just about every painful condition there is over the the more than 14 years of my training and practice, and most patients are stuck trying to turn off the pain signal with a vast array of pills, creams, powders and potions. Some patients I see are taking more than 10 different prescription pain pills or supplements on a daily basis, and yet still report 10 out of 10 pain. When one pill doesn’t work, they are prescribed another, and another, and soon accumulate a pile of pill bottles – all of them useless. Although I help hundreds of patients each year live more functional lives with less pain, and with far less medication, there are so many more people out there that don’t have the luxury of being seen in a practice like mine. Millions of people spin around the vicious pain pill cycle, still suffering every single day regardless of the amount of medication they are prescribed. I am tired of sitting back and reading the statistics about the escalating pain epidemic in this country. What is the solution the medical system has arrived at over the last several decades, despite all of the research above? Throw newer and more powerful medications at the problem rather than empowering patients to make some simple lifestyle modifications that that lead to true healing of the problem, and in time, to a long-term treatment for the problem. This is nonsense. Again, the prevailing “treatment” for pain is to treat the light on the dashboard, NOT the underlying problem. Unfortunately it is a byproduct of the time crunch that health professionals face in their practice, and the simple fact that very few insurance companies anymore will pay for preventive care visits. This has to stop now. That is why I decided to detail the exact approach I use with patients each and every day in my office. With over 100 million people living in pain in the U.S. alone, my lofty goal is to help at least 1 million people change their lives before 2020 – to help them naturally decrease their pain, recover their function, restore health, and live life at the highest level of function each day for the rest of their days. What if there was a way to fix your pain that required nothing more than eating everyday foods?What if it was simpler, safer, and more effective than any pain pill? I’ve called my unique system the The Pain Free Diet. It’s the ONLY food-based pain-reduction program on the market, which means that there are NO expensive supplements or synthetic pain pills to take. Using delicious whole foods you will learn to reduce pain and inflammation, greatly improve your recovery, and finally get back to a life you can fully enjoy. And the best part is… It’s so simple and effective that if you’ve never followed any program like this before, or even if you’re the worst cook in the world (the program includes dozens of simple, great-tasting anti-inflammatory recipes), you’ll still experience dramatic reduction of your pain levels in as little as two weeks – guaranteed. I don’t like the word “diet” as it implies something you do for a short time and usually for a short-term effect. It also commonly means eat bland foods, restrict your calories, and be miserable. Sounds like something you won’t likely stick with long-term, right? That’s why I was reluctant to even use the word diet in the title of this book. The system you will learn about is so easy to follow that I hope it will become a life-long lifestyle change, not a temporary diet “fix”. Remember how I told you even some common healthy foods (like tomatoes, potatoes or eggplant) may be major pain triggers for you?Well, I’ll show you a very simple method that will help you determine and eliminate the exact foods contributing to your pain. I’ve called it the S.O.S. Method, because it will “save” you from these pain-triggering foods, and save you from a continued life of pain. Simplify Temporarily remove foods that are known pain triggers – explained in Chapters 10 and 11. Optimize Heal your body with healthy anti-inflammatory and nutritious foods – in Chapter 8 you’ll learn the exact foods that will flip a switch to get your body killing pain without pain pills. Systematic Re-introduction Reintroduce your favorite foods gradually while tracking your Systems Diagnostic Report – step by step instructions in Chapter 14. 1) For 2 weeks, you are going to follow simple to prepare and delicious pain-killing recipes that will detox your body and start the healing – and start reducing your pain and inflammation. 2) After 14 days, you will reintroduce your favorite (and potentially problematic) foods in a very strategic order in order to identify exactly which foods may be contributing to a life of ongoing pain. 3) Along the way, you’ll keep track of how your body reacts to certain foods using our Systems Diagnostics Report. 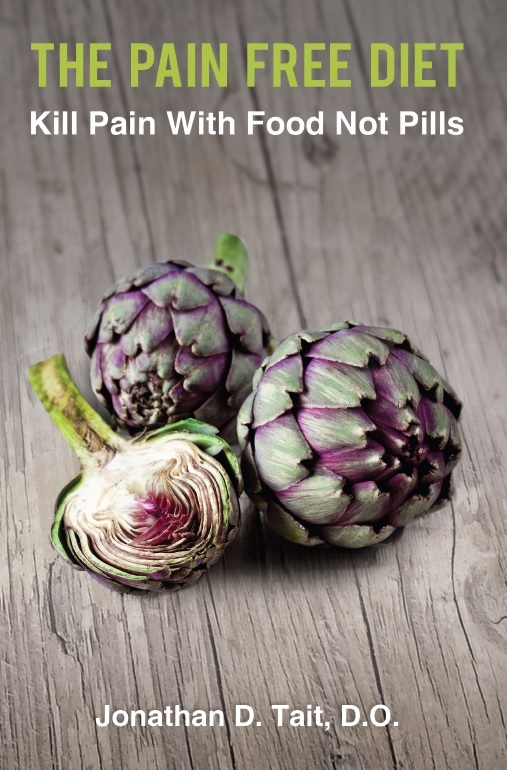 Yes, this is how simple killing pain with food can really be! How Much Money Are You Currently WASTING On “Quick Fix” Pain Treatments? The problem with other “pain solutions” is that they rarely address the underlying root cause of your pain. I’ll be honest. The Pain Free Diet is making a lot of people unhappy: Pharmaceutical Companies and Pharmacies – Many of my patients will drastically reduce or even eliminate the need for pain medications. That means decreased revenue for these big businesses. Medical Device Companies– As your pain decreases and you become more functional, you are probably not going to be needing equipment like braces, canes, or walkers as much, let alone thinking about laying out the money forone of those motorized scooters. Although the people in the commercials look like they are having the time of their lives doing donuts in the kitchen, I would rather seeing you out doing laps on the track or trail. Some Pain Specialists and Surgeons – Lets face it, they make a lot of their money doing procedures and prescribing pain pills. As you get better with some simple lifestyle changes, you will not be requiring their services any longer. Other “Health Practitioners” or “Pain Specialists” – We all have heard stories of unscrupulous practitioners who prey on patients in pain. They chargeridiculous sums of money for “treatments” and supplements that have no chance of helping without a proper foundation in place for treatment of your pain. Frankly, I don’t care if they make less money. I’m pretty sure they’ll do just fine. My calling and life mission is to help as many people as possiblesafely reduce their pain, maximize recovery, and re-engage in life, without needing to be imprisoned in these costly solutions. Can I guarantee you will never need to use any of the other treatments listed above? Of course I can’t. But I can guarantee that once you start using The Pain Free Diet, you willnever be as dependent on these pills, shots, creams and potions as you may have been in the past. How Much Would It Cost If You Wanted Me To Teach You This System? If I calculated the time it would take me to teach you this powerful system, and then multiplied by my hourly consultation rate of $350, you would be spending well over $1000 in office visits just to get started. This does not even factor in the type of nutritional advice you would have to pay a nutritionist to create the meal plans and recipes. That could be hundreds of dollars depending on the consultant you see. When you look at it that way, I think you’ll agree a price of $297 would already be a fair discount. But I don’t want you to pay anywhere near this much… I created The Pain Free Diet to help you and many other people in pain see that there is a better way to kill your pain. I know money can be short for many people with the current state of the economy, that is why I kept the price of my this potentially life-changing information at a very reasonable introductory price of just $9.95. Chapter 5—SUV-Sized Inflammation—Is Your Food Really to Blame? What is inflammation? What foods stoke the inflammatory fire and maintain your pain? Chapter 6—Fix-A-Flat—Are You Willing to Risk a Blowout? Chapter 8—Are You Putting High Octane Fuel in Your Tank?—You Are What You Eat! Healthy, quality food supports health and quality function. Are you making the right choices? Chapter 9—Interpreting the Owner’s Manual—Do You Know What Food Labels Really Mean? More than 50 pain killing recipes for breakfast, lunch, dinner, snacks, and even dessert! Again, if I was to personally guide you through each chapter of the book one office visit at a time it would cost you hundreds of dollars and weeks of your time. Instead, you can get started today, read the book in a few evenings and be feeling dramatically better in a couple of weeks for a fraction of the cost. Yes. I have implemented this program with hundreds of patients in my practice, and not one has told me they do not feel better in some way. Take Advantage of Our 60 Day Guarantee And Experience The Power Of The Pain Free Diet Today! You only live once – and life is too short to spend it struggling with recurring injuries, mediocre quality of life, or the depression that can come with chronic pain. Why settle for ineffective pain-killing treatments? Why continue to spend money on other appointments, MRI scans, pills, shots and other short-term solutions? The Pain Free Diet is a natural, sustainable, and enjoyable method of reducing pain and inflammation. With the strategies you will learn in the book you can live a life with less pain – and you can finally escape the pain cycle you’ve been stuck in for way too long. But don’t just my word for it. Join the people who have already changed their lives and decreased their pain with the power of real food. I’m so sure you’re going to love this program that I am going to give you a full 60 days to try it out risk free. If you can honestly say that you followed the program and saw no improvement in your pain, function, or quality of life, or that the information was of no value to you, then just let us know before the end of your 60-day trial and we’ll give you a full refund. If it doesn’t deliver you won’t pay a dime. The Pain Free Diet May NOT Be Right For You! Let’s face it… The Pain Free Diet is the only 100% FOOD-BASED pain killing solution on the market that will dramatically reduce your pain in as little as two weeks without dangerous pills or shots. The goal of this “food journey” is to reduce your pain, but it is also to educate you in the methods to continually monitor your inflammation and pain levels so that you continue to reduce your pain long after you have completed the program. Nowhere else will you get a complete “pain consultation” from a board-certified physician guide you through an incredibly effective pain killing program, provide you with the knowledge and tools to stay pain-free for life, and charge less than the cost of your last prescription refill. Try going to your local doctor or nutritionist and asking them to lay out 2 weeks of nutritional advice, dozens of pain killing and healthy recipes and give you access to their staff 24 hours a day, 7 days a week… Good luck! It just isn’t going to happen in today’s healthcare system, not unless you’re willing to pay thousands of dollars for a private on-call physician. The Pain Free Dietgives you all of these tools and resources without the outrageous price tag. You get the pain killing recipes, critical pain management information and strategies, as well as support throughout the program – guaranteed! However, as much as I would love to help you get pain free (when other solutions have failed) and live with greater mobility, energy, and health, I also realize this program is not for everyone. This program is going to take some work to re-order your lifestyle and diet to build long-term health and a healing environment. I want people that are sick and tired of living in constant pain and fed up with the pain pill cycle. I want those who are dedicated to taking action. …is no silver bullet. …is going to take some work, but I will guide you through the process. …needs to be followed as outlined, because frequent “cheating or treating” will make it impossible for you to determine what foods are triggering your pain. Don’t worry – I will tell you when it’s time to let loose.…depends on your own ability to take action. I will help you along the way, but cannot do the work for you. The Pain Free Diet is intended for those who are dedicated to following our unique whole food-based approach to killing pain with a 100% commitment. If you are looking for another “pop a pill or supplement” solution, and do not care about the long term consequences to your health, then this is NOT the program for you. But… If you are serious about getting pain free… if you want to start exercising again… if you want to feel years younger and get rid of that stiffness in your muscles or joints…and if you want to rid yourself of the inflammation that makes you so prone to future injuries… then The Pain Free Diet is for you. It doesn’t matter if you’re man or woman… young or old… feeling a little bit of pain or so much pain you find it unbearable… As long as you are determined to dramatically reduce your pain and see the power and value of killing pain through natural foods (not supplements or dangerous pills), then this is right up your alley. Are you ready to join the hundreds of clients who were able to reduce pain with food instead of pills? Click the “Add to Cart” button below and let’s get started! “Can I use this diet while doing a rehab program?” Absolutely! If you’re trying to recover from an injury, you NEED a proper rehab protocol. In this program, I’ll refer you to some of my colleagues, should you be looking for this kind of information. The Pain Free Diet will work synergistically with any rehab program (unless otherwise indicated by your trusted professional for some odd reason) to increase your body’s natural healing ability, reduce inflammation, and reduce pain during treatments, ultimately accelerating your recovery from injury. “What makes this pain-killing diet different from all the rest?” That should be pretty obvious by now. There is truly nothing like this anywhere! Not even your local doctor or nutritionist can provide you with the tools and support that you’ll get with our program. The Pain Free Diet is the ONLY 100% FOOD-BASED pain-killing program on the market supplying you with 2 weeks of meal plans and dozens of mouth-watering anti-inflammatory recipes. 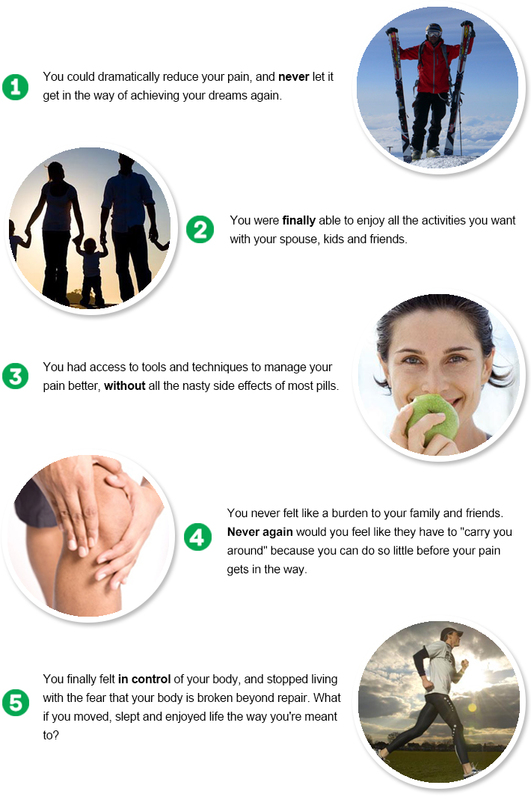 Sure there are plenty of pain-killing pills, creams, shots, expensive supplements and other quick fix solutions, but if you’re looking for lasting pain reduction and are serious about reducing your pain for life then this is the program that will deliver. Unlike other anti-inflammatory dietary protocols that simply add anti-inflammatory foods to your current diet, our unique S.O.S. method helps identify the inflammatory foods you may be eating every single day. “I’m an athlete with particular dietary needs. Will I keep my strength, size and performance while on this program?” There’s no doubt this program will fulfill all nutritional needs, regardless of your training program. The portion sizes can be modified to meet daily calorie and macronutrient needs. In fact, by removing common problematic foods like gluten, you will decrease your total body inflammation while likely improving your performance and recovery. Although they didn’t make a deep run in the playoffs, the entire Green Bay Packers football team implemented a gluten-free diet for the 2012 season. Most reported improved performance, better recovery, and fewer illnesses or injuries over the course of the season. “What do I need for this program?” Other than food and water, you don’t need much. The most important element needed is dedication to follow the program as consistently as you can. “What am I allowed to eat during the diet?” Plant-based food including vegetables and fruits, legumes, gluten-free grains, healthy cooking fats, most nuts and seeds, and quality animal products like eggs, grass-fed meat, wild game, fish & shellfish and pasture-raised poultry or pork. Our goal during the program is to give your body a break from the foods that are potentially causing inflammatory reactions. These foods include the 3 little known allergenic additives you’ll learn about in the Diet Manual. With an arsenal of delicious pain-killing recipes, you’ll wonder why you ate these allergenic and inflammatory foods in the first place. After the initial 14-day “jump start” program, you will then have the choice to reintroduce some of your favorite foods back into your diet. This will be done in a very systematic way that will allow you to identify what foods are problematic for you (we’ll guide you along the way). “Are the recipes complicated, do they require expensive ingredients, or take a long time to prepare?” No, no, and no. 90% of the recipes in the program take less than 15 minutes to make and require only everyday ingredients that you can find at your local grocery store. The other 10% of the recipes take slightly longer to make simply because they require more “cooking” time. Once the initial preparation has been completed (usually a few minutes), you can simply “set them and forget them”. A great example of this is our “Spicy Chicken Pilaf”. Also, no matter if you’re a total newbie or much more experienced when it comes to cooking, I’m going to guide you along the way. “Are you going to sell me pills and costly supplements while on the program?” No. This is really the “anti-pill and supplement plan”. The program doesn’t require any pills, supplements or other additional resources to deliver on the guarantee to reduce your pain. In the future, I may recommend natural products or supplements that can decrease your pain like certain creams (to apply after injuries or strenuous exercise), supplements (that help reduce your inflammation), or other exercise programs (to stabilize your joints and improve your mobility). Right now, your main focus should be building the healthiest, anti-inflammatory diet possible with whole foods. Later on I will get you up to speed on the best natural supplements to supercharge the program. I will only recommend products and programs that I use personally or recommend to clients, patients, family and friends. “Can I still do this program if…I’m pregnant, breastfeeding, traveling, or have never done anything like this before?” The short answer is yes because the program is based on dietary improvements, but I always recommend that you check with your doctor before getting started, especially if you are pregnant or breastfeeding. However, The Pain Free Diet is designed specifically for, and will most profoundly and positively affect those who are in pain. If you are traveling, it is possible to do the program, but it will be more difficult. The simple reason behind this is that most foods you’ll find while traveling will contain allergenic ingredients that will be removed during the program. If you have a lot of self-control and can read food labels ingredients closely, you maybe be able to pull it off, but it is going to take some serious extra planning. “Can I stop taking my pain pills and other treatments and use this instead?” It would not be wise to do so, mainly because I do not know about your particular situation or conditions, but also because legally I cannot dispense particular medical advice such as this without seeing your for a consultation. That being said, once you feel the dramatic reduction in pain with The Pain Free Diet, I highly suggest you ask your doctor if you can reduce or eliminate the dose or type of pain-killing medication you may currently be taking. If you’re serious about getting rid of your pain – there’s no excuse for missing this opportunity. Do it now and change your life for the better! P.S. Although most physicians have good intentions, their “education” and the medical system have programmed them to believe that pain is treated with a pain pill. The simple fact is that it is up to YOU to take ownership and responsibility for your health and seek out the best treatment you can find. “An ounce of prevention is worth a pound of cure.” Isn’t that what you are really looking for? A simple and natural way to get back the life you want – a more pain-free life. P.P.S. Remember that you are covered by a 100% money back guarantee. Grab it RISK-FREE and start killing your pain the right way – today. NOTE: The Pain Free Diet is a digital download in PDF format. No physical products will be shipped. After you order, you will get INSTANT ACCESS to download and view all the files onto your computer. The format is Adobe Acrobat PDF, which can be viewed on Mac or PC. The website’s content and the product for sale is based upon the author’s opinion and is provided solely on an “AS IS” and “AS AVAILABLE” basis. You should do your own research and confirm the information with other sources when searching for information regarding health issues and always review the information carefully with your professional health care provider before using any of the protocols presented on this website and/or in the product sold here. Neither ClickBank nor the author are engaged in rendering medical or similar professional services or advice via this website or in the product, and the information provided is not intended to replace medical advice offered by a physician or other licensed healthcare provider. Our mission is to focus where the current health care system has faltered, and is failing—preventive care and maintenance of health to reduce pain and sustain long-term vitality and function.